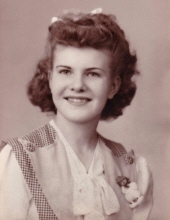 Lorraine E. Martin died at Meadowood Nursing Center in Clearlake on February 3, 2019. Lorraine was a retired pastor of the United Methodist church. She came to Lake County 6 years ago, joining her son and daughter-in-law, James Martin and Martha Bekerjian in Clearlake. Lorraine was the Mercer County (IL) woman of the year in 2007 based on her activities in the church and the community and expecially for implimenting a food pantry operating from the Viola Methodist Church which is still running today. Lorraine will be missed by her family and the hundreds of people she has influenced as a pastor and friend. Lorraine will be buried beside her husband in Bishop Hill, Illinois. A memorial service is planned to be held at Lower Lake Methodist Church on February 16 at 11:00 am. To send flowers or a remembrance gift to the family of Lorraine Elsie Martin, please visit our Tribute Store. "Email Address" would like to share the life celebration of Lorraine Elsie Martin. Click on the "link" to go to share a favorite memory or leave a condolence message for the family.